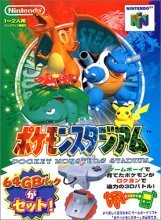 This edition of Pokémon Stadium began the whole Battle Simulator aspect of the Pokémon games. Release in Japan in 1998, this game provided the first instance of home console & portable compatibility in the form of the Transfer Pak. This game allowed you to use 42 of the 151 available Pokémon and battle with them in 3D. Pokémon Stadium allowed you to connect your Pokémon Green, Red, Blue and Yellow games to the Nintendo 64 and use the Pokémon in a variety of battle modes. These battle modes featured rules based upon official tournaments and in one case features teams of players who won those tournaments in the various areas. In addition to the battle modes, Pokémon Stadium provides various organisational aspects including sorting boxes for Pokémon and items and giving you access to a full 3D Pokédex. Despite the fact that only 42 Pokémon are useable within the game, all 151 Pokémon are viewable within the Pokédex and various other modes. Unlike its successors, this version of Pokémon Stadium also doesn't provide any gifts for the player but it does allow you to teach Pikachu the special move Surf if you use it in your winning teams in one of the battle tournamenets. This game never made it for release outside of Japan due to a variety of factors. First, it lacked a lot of Pokémon capable of being used, making it limited in scope and secondly, it was heavily criticised for its difficulty. Instead of releasing this version of Pokémon Stadium internationally, a sequel was created with toned down difficulty, all 151 Pokémon and a variety of new features, and was released internationally as Pokémon Stadium.